Proportional directional valves can also be used very advantageously in industrial environments. For this reason, the highly flexible series of hydraulic power units of type FlexUnit® are now available with this option as standard. 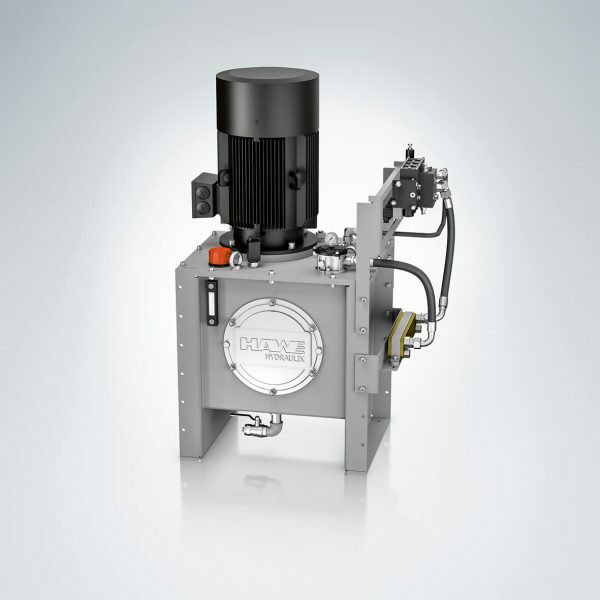 The completely modular hydraulic power unit FlexUnit® offers operating pressures up to 700 bar and delivery flow of up to 90 l / min. It is configured from a standard design kit and can be extended by many options at the click of a mouse. A new addition is the direct mounting option of the proportional directional spool type PSL. This control block allows flow rates up to 80 l / min at operating pressures up to 420 bar. It can be operated electrically, hydraulically, pneumatically or proportionally via hand lever. The integrated load-sensing system with an inlet pressure compensator ensures that the volume flow of the constant-displacement pump is not dissipated via the pressure relief valve – energy losses are avoided. Many additional functions as flange blocks are available, e.g. shock valves, load-holding valves or suction valves. As an additional extension of the FlexUnit kit, various options for efficient recooling of the oil are now available. The oil or water coolers are selected according to the pump capacity and the expected waste heat. Thus equipped, many new applications for the FlexUnit result, such as test systems, presses for material testing or briquetting.